A family of twelve from the Hebrides on the deck of the Marlock, enroute to Canada. They sailed in their thousands, packing little more than their hopes and dreams, to a land of opportunity. In North America, Tartan Week is beginning the annual celebration of the Caledonian immigrants who helped build the United States and Canada. This year, second, third and even fourth generation Scots in the USA will also be able to learn how and why so many men and women left Scotland and set sail across the Atlantic, as one of our country’s leading migration historians arrives to discuss her research. Professor Marjory Harper, from Aberdeen University, has spent several years exploring the stories of Scots who migrated to America in the 19th and 20th century, and will take part in a series of Scotland Week-related talks and panel discussions in Chicago and New York. As part of her research, Professor Harper helped to spearhead the creation of a free online tool, The Scottish Emigration Database, which contains more than 21,000 records of Scots emigrants who embarked from Glasgow and Greenock for non-European ports between January 1 and April 30 1923, and at other Scottish ports between 1890 and 1960. 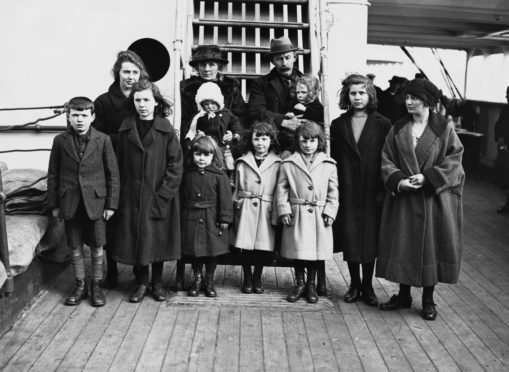 In 1923 alone, more than 89,000 Scots left for America and Canada, and Professor Harper says a variety of economic factors influenced many to seek a new life. “There was underemployment and unemployment in a lot of occupations in Scotland, not least in the shipyards,” explained Professor Harper. “From The Scottish Emigration Database you can sometimes trace whole tenements or streets in parts of Glasgow, where there was company housing, and a lot of men would be emigrating on the same ship. You can see by their occupations that they were all probably in the same team of tradesman, working in the shipyards. “There were also opportunities overseas, and these were mediated, as they had been throughout the previous century, by newspapers, pamphlets and recruitment agents giving lectures, as well as most importantly by people writing to their relatives to say how much better life was better across the Atlantic. In recent years, Professor Harper has conducted interviews with 100 emigrant Scots, and many of their stories will form part of her Scotland Week talks. “Parts of the talks I’m giving are based on a book I published last year called Testimonies of Transition: Voices from the Scottish Diaspora. The book featured 100 interviews I conducted with people who emigrated from Scotland all over the world, but quite a lot of them to North America,” she said.